What is the Acclaro Social Value Programme? Originally driven by the Public Services Act, Social Value is an opportunity to improve people’s lives through the power of responsible business. By considering how purchasing decisions can and will deliver social, economic and environmental benefits for the local community. This Act brings opportunities to both public procurers to save money on vital services, and pushes service providers to show leadership. By building their reputation as a responsible business and showing they can generate profit while offering positive returns to the communities that they operate. However, in light of this, there is currently an overwhelming fixation to solely measure the Social Value that an individual company can predict to generate. But this negates the validation, the quality, and the strategic approach to attain the number. Whether you are an organisation procuring services, or an organisation tendering for clients, the Acclaro Social Value Programme is a means of helping your business to understand Social Value as a concept, to deliver it in a meaningful way, while upholding the integrity of the numbers that are predicted. The key to implementing Social Value successfully is paying attention. From local stakeholders to national stakeholders and the community at large, knowledge of who you’re partnering with and why is crucial in mapping and delivering appropriate and lasting Social Value. Whether you are a business that generates social value for a client, or looking From design stage onwards, we take you on a cyclical journey. We Assess, Engage, Define, Execute and Operate. We recognise that many sectors are still getting up-to-speed with what Social Value is and means so with a combination of knowledge and industry expertise, we guide companies through a pivotal learning process. Our Social Value team is part of the UKGBC Social Value working group. As a business we regularly engage with industry leaders to drive improvements in the provision of Social Value across commerce and the built environment. 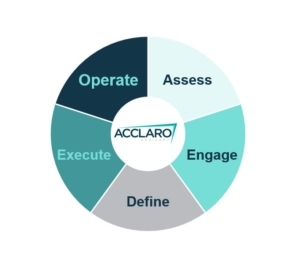 Acclaro helps you to define not only what Social Value means to your organisation but what it means in specific initiatives. We help you to plot goals, targets and performance metrics so you can contextualise the precise needs of the community. We help businesses to review the efficacy of existing Social Value initiatives so they can raise ambitions for next time. We ensure that, when the time comes to engage local groups, it’s a collaborative process of listening and learning so, together, we can create an appropriate vision, and meaningful delivery, for real Social Value. Social Value and opportunity go hand in hand. New contracts and contract renewals present a blank canvas for innovation: a chance to assess the successes and the shortcomings of existing projects and use them to inform new and better community initiatives. When Social Value projects are up and running and empowering the community, the area always benefits in real, tangible ways. Improving infrastructure attracts new retailers and businesses. Beautification and leisure initiatives boost reputation, desirability and visitor numbers. New amenities add colourful new dimensions of life for local residents. Business who can demonstrate successful delivery of Social Value projects – the more ambitious the better – stand in much better stead for being awarded more and bigger contracts to do the same elsewhere. When an organisation carves a solid reputation as an expert in delivering Social Value then profile, reputation and business always feel the benefit. Working with Acclaro’s team, organisations have the best chance of bringing successful Social Value projects to life in ways that benefit everybody. And by helping companies to convert outcomes into education and training packages, they can continue to improve on what has been, raising the bar and writing stronger Social Value into any future projects.